What Is Estroven Maximum Strength plus Energy? Estroven Maximum Strength plus Energy is a one of six Estroven products. 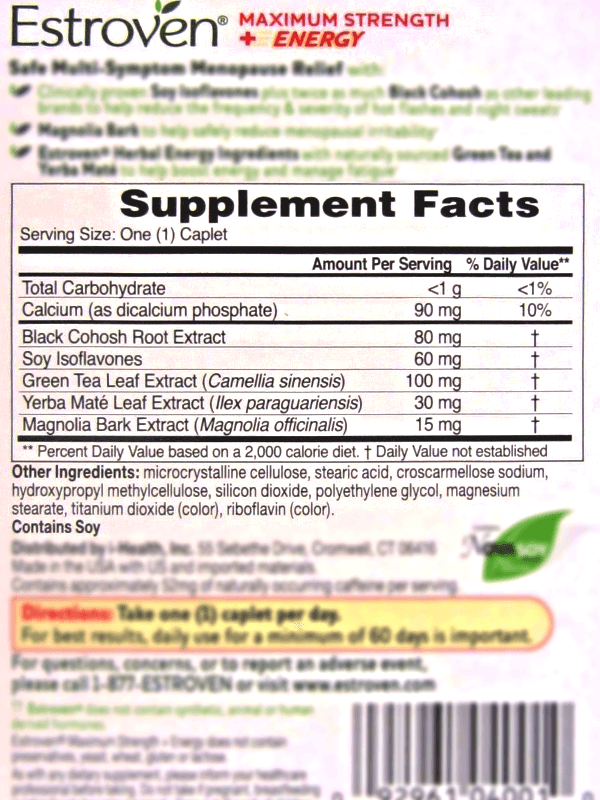 Estroven Maximum Strength plus Energy prides itself in containing twice the amount of naturally-sourced black cohosh than other leading brands (plus other, clinically proven and naturally sourced herbs and constituents) to help reduce menopausal symptoms, including hot flashes, night sweats, irritability, mood swings, low energy, fatigue, and more. Works throughout menopausal transition. Results vary since the blend acts differently for everyone. 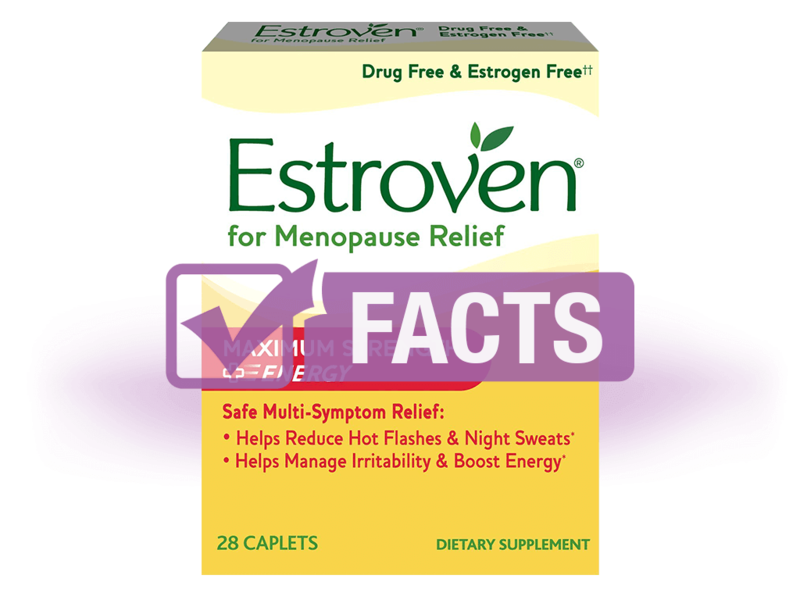 Estroven's site isn't 100% clear on HOW their ingredients work to relieve menopausal symptoms. Nevertheless, the company does credit the reduction of hot flashes and night sweats to black cohosh and soy isoflavones. It also attributes relief from irritability, fatigue, and mood swings to the magnolia bark and green tea with yerba mate. Estroven Maximum Strength plus Energy does NOT contain synthetic estrogen or any common allergens (yeast, wheat, gluten, and lactose). Estroven Maximum Strength plus Energy is safe to take for most women. For those with pre-existing hormone-receptive health conditions (breast, cervical, or ovarian cancer; endometriosis; fibroid tumors), due to the immense amount of phytoestrogens present, the supplement could aggravate symptoms. It is not recommended for those who are pregnant, nursing, or may become pregnant as well as for those with liver damage or high blood pressure. Estroven's website does not mention any side effects. From our research, most users do not experience any. However, there are numerous contraindications and user-reported side effects, such as allergic reactions, heart palpitations, and fatigue. Also, research shows that taking excessive amounts of black cohosh can cause liver damage, headaches, abdominal pain, diarrhea, visual disturbances, joint pain, nausea, tremors, and more. Positive reviews praise Estroven Maximum Strength plus Energy for providing relief from menopausal weight gain, fatigue, mood swings, night sweats, and especially hot flashes. Customers also consider the price comfortable and feel the supplement's effects quickly lessen upon taking it. Negative reviews focus on the supplement's ineffectiveness, unwanted side effects, and the fact that it does not contain vitamins in the blend. Positive reviews focus on the supplement's ability to relieve hot flashes, mood swings, insomnia, night sweats, fatigue, irritability, and more. Negative reviews critiqued the supplement for simply not working. Take one capsule per day near mealtime. For best results, daily intake is recommended for a minimum of 60 days. Please consult with a healthcare professional before taking. Store the supplements at room temperature with no exposure to heat, humidity, or direct sunlight. You can find where to buy all Estroven products online at: https://www.estroven.com/. Estroven Maximum Strength plus Energy can be bought through Amazon, and most Estroven products are available for purchase in major pharmacy retailers, such as CVS, Walmart, Target, Rite Aid, and Walgreens. Use the store search tool on their website for locations near you. Estroven® is a registered trademark. Conforti, A.S. et al. (2012). Yerba Mate (Ilex paraguariensis) consumption is associated with higher bone mineral density in postmenopausal women. Bone, 50(1), 9-13. Doi: 10.1016/j.bone.2011.08.029.